Not to be confused with Indium. This article is about the chemical element. For other uses, see Iridium (disambiguation). 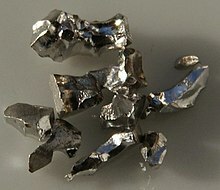 Iridium is a chemical element with symbol Ir and atomic number 77. A very hard, brittle, silvery-white transition metal of the platinum group, iridium is the second-densest metal (after osmium) with a density of 7004225600000000000♠22.56 g/cm3 as defined by experimental X-ray crystallography. At room temperature and standard atmospheric pressure, iridium has a density of 7004226500000000000♠22.65 g/cm3, 7001400000000000000♠0.04 g/cm3 higher than osmium measured the same way. It is the most corrosion-resistant metal, even at temperatures as high as 2000 °C. Although only certain molten salts and halogens are corrosive to solid iridium, finely divided iridium dust is much more reactive and can be flammable.